By shockingly popular demand, a big, unorganized list of things I love about fall. Fall is just over a week away, and the weather feels like it’s starting it’s slow turn around the corner. Today was a gray, rainy, dreary day but it got me excited for the change of seasons. The smell. 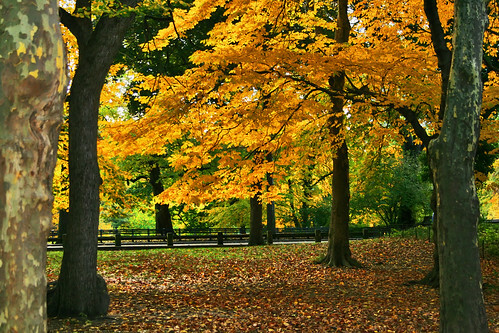 Cold air has its own smell—crisp and clean—and in fall you start getting a hint of it in the breeze. The food, in general. Summer is a time for light fare, both in flavor and weight. Fall is harvest time, and time for more substantial, savory stuff. Inclement weather. Summer storms are good, but there’s so much more variety in fall. Sometimes it’s just windy, bright and clear and cool and windy. You get light rain and heavy rain and thunderstorms. And those beautiful, red and orange fall days. Pie. I’m usually unwilling to stand near a hot oven or eat hot, oven-fresh pie during the summer, but once it starts cooling down, and apples and pumpkins are plentiful, it’s pie time. The clothes. I like long sleeves, sweaters, coats. It’s just the temperature where you’ll be comfortable in heavy clothes. Hiding inside. One of the best parts of the weather is how warm and comfortable home feels compared to the outdoors. The colors. Summer is green and yellow, winter is white and gray, spring is light green and pink, but fall is red and brown and orange: deep, saturated colors. Hot tea on a cold day. Dry leaves skittering across the road. The holidays. Almost all of the best are in the fall, including my favorite, Thanksgiving. The tension, suspense, and feeling of change. The world changes around you, rapidly. Weather is hard to predict and changes often. Hot, summer days give way to frosted breath and first snows. Trees start green and end stark and bare. Leaving cider with cloves and allspice in a slow cooker all day. In fact, cinnamon, cloves, nutmeg, allspice, in general. The light. As fall progresses the light goes through more and more of the atmosphere. It helps give fall, especially mornings and evenings during the golden hour, a really distinctive feel.